The landscape architect was charged with developing master plan concept for the park that included conservation of the park’s historic fabric and allowed for new active and passive recreational use. In particular, the master plan highlights the park’s c. 1930’s period of significance and the structures and land uses that remain in the park from that time period. Proposed new uses included history trail, water element and playground, concert seating, and a memorial plaza. 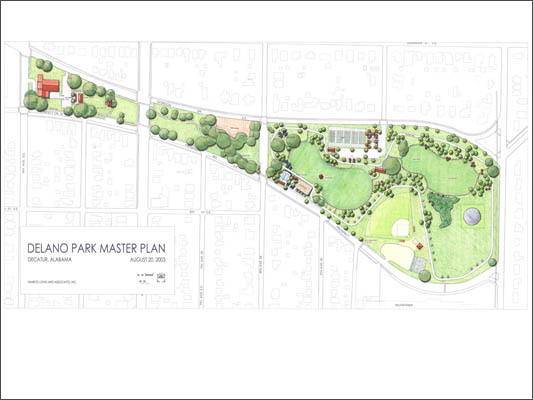 The master plan has generated much interest in Delano Park and its conservation and development. The city officially adopted the master plan in Fall 2003, and has successfully used it as an aid in obtaining state and federal funding for four new projects within the park in less than 2 years.